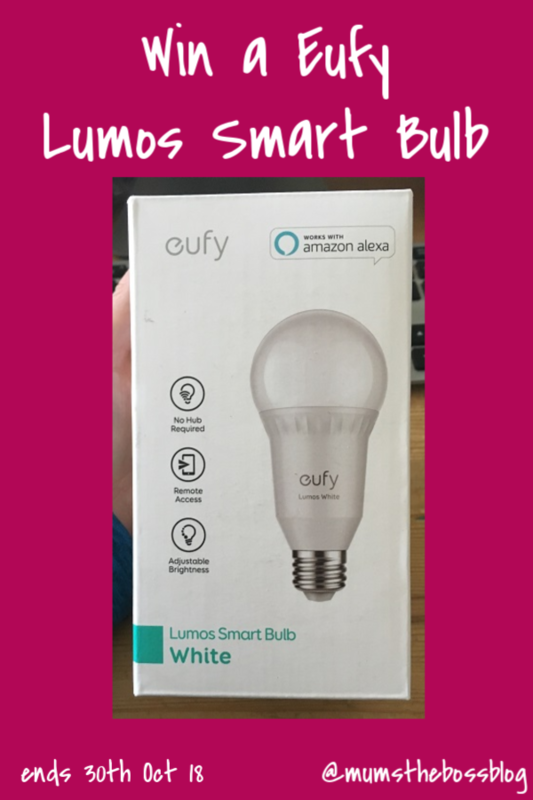 Disclosures – I was given a Eufy Lumos Smart Bulb to test in order to write this review, but all opinions are my own. Links to EufyLife and Amazon in this article are affiliate links, so I will be compensated if you buy a Eufy product after reading this article. After my rapturous review of the Eufy Robovac (which is still one of my all-time favourite pieces of household kit), the lovely people from EufyLife have now sent me a Lumos Smart Bulb to review, and they have 2 Smart Bulbs ready and waiting to give away to 2 lucky readers. So prior to this review, I had vaguely heard about the Smart Bulb concept – you can now control the lighting in your house remotely, along with various other household equipment, using an app. I will admit to being a bit behind the times though – prior to receiving this device I had no other smart home devices and I own neither an Alexa nor a Google Assistant. My husband is deeply suspicious of such things, and I think it will be a long time before he lets one into our home, if ever. So as a self-confessed gadget monster, I was interested to see what I could do with the Eufy Lumos Smart Bulb without using voice-activated controls. The bulb arrived very promptly after ordering, but I hit the first snag straight away – it has a screw fitting, and all the bulb sockets in my house in the UK are bayonet fitting, which would be the case for a lot of homes in the UK I think. 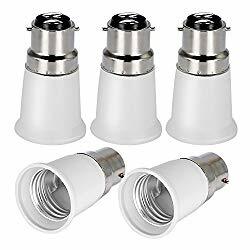 But where there is a gap in the market, somebody jumps in to fix it – and I soon discovered I could buy some adapters, so that the Smart Bulb would fit in my sockets. The above image leads to an Amazon affiliate link, but this won’t be a problem for my lucky winners – the adapters came in a pack of 5, so I will post one on to each of my winners if they need one. So after I waited a week or so for the adapters to arrive (I suspect from the far East), I unboxed the Lumos Smart Bulb and took a look at it. The model that I have, am reviewing and giving away is the Basic Lumos Smart Bulb White, which is the only one of this range that is currently available in the UK. But I digress – the basic white Smart Bulb that I have, has two basic features that you can control – you can switch it on and off and you can also choose the brightness. These features can be controlled via a switch on the app, or they can be scheduled using the calendar function on the app. 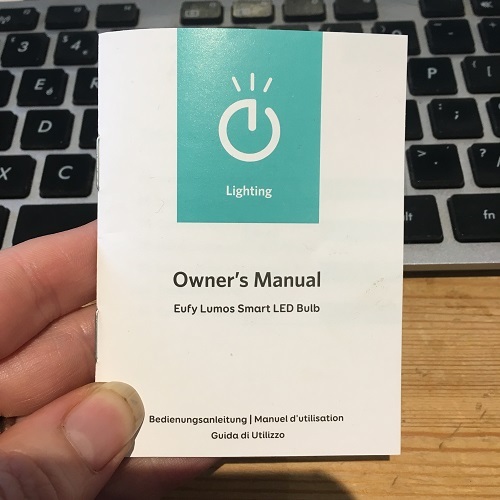 The bulb comes nicely packaged, and has a cute little Owners manual, printed in English French, German and Italian. It’s very straightforward to set up – although please note before you begin the process that you will need your home WiFi password. The bulb itself is a bit heavier than I was expecting – when you use it, the glass part of the bulb stays cool as it is a LED, but the socket bit warms up a little bit. First of all, you plug the bulb into your chosen socket (using the adapter) and turn it on. The bulb should flash on and off a few times before stopping in the on position. 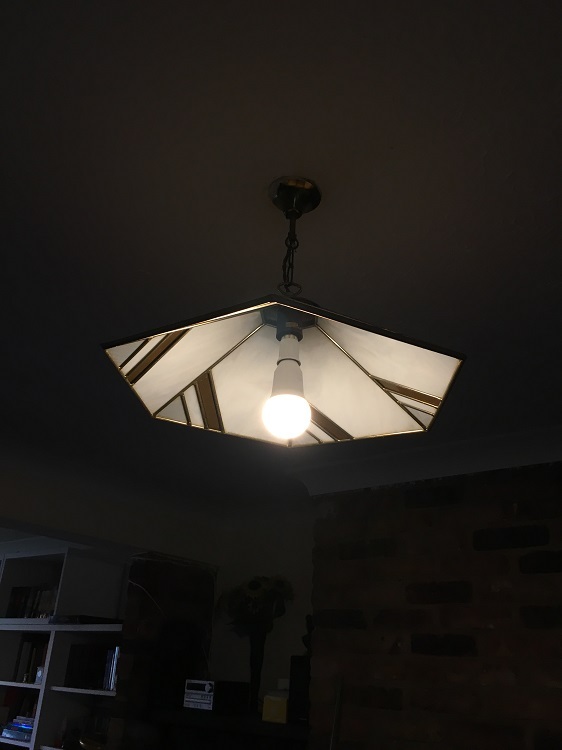 As you can see, it is a bit bigger and hangs a bit lower than a normal bulb. I probably won’t use it in this fitting permanently as it does stick out a bit and looks a bit odd, but I just used it for testing purposes as it is quite near my WiFi router. It would be better in a lampshade that covers it up a bit more in my opinion. Next, you install the EufyLife app on your Android or iOS device, and the manual talks you through connecting your device to the Smart Bulb’s own WiFi signal. This is only a temporary thing though – once you have done that and connected your phone to the bulb, then you can connect the bulb to your own home Wifi network – this is where you need your password. If you don’t have your password or have forgotten it as I had, then you may get an error, in which case you will have to reset the Smart Bulb, by turning it on and off five times until it starts flashing as it did above. So, once you have connected your phone and the bulb to your home Wifi network then you can control the bulb from your app or using the scheduling function. Here’s a brief video of me testing out the controls on my app. So basically you can switch the device on and off, dim it or schedule it, even if you are not in the room. It’s very easy and worked for me exactly as it said on the tin. My testing of this is fairly basic as I don’t have Alexa or Google Assistant, and I couldn’t make the bulb work with Siri on iOS. But I can still figure out a few uses I could put this bulb to, depending on where I placed it in the home. Turn on the light outside the front door when the doorbell rings, so the person there knows that somebody is coming. Turn on the light outside the front door when I come home, so I can see what I’m doing with the door key. Based on the most popular of those, I think this bulb will probably live ouside on the porch most of the time and I’ll use it for those people who are coming and going at night. Then if I go on holiday, I may bring it indoors to act as a security light and/or I may go and buy another one. One feature which I didn’t test out is that if you have several lights in the house with this system you can group them together into groups of your choice and switch them all on or off together. That would be great for my living room, where we currently have 3 different switches to switch everything off at night. After a brief test, I quite like the Basic White Lumos Smart Bulb as far as it goes. I suspect I would really love it if I had an Alexa or Google Assistant to link it to, and must admit, I love the idea of being able to change from warm light to cool white light and to change the colour, so I hope that those bulbs become available in the UK soon. 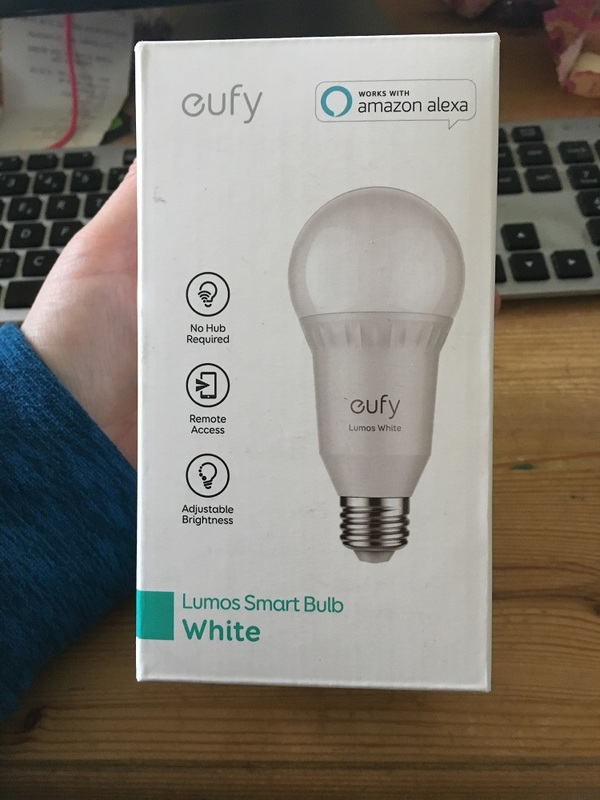 You can buy these bulbs (and the Robovac) from the Eufy UK site , and you can change the flag on that if you are in the USA or Germany to see the relevant products for your country.